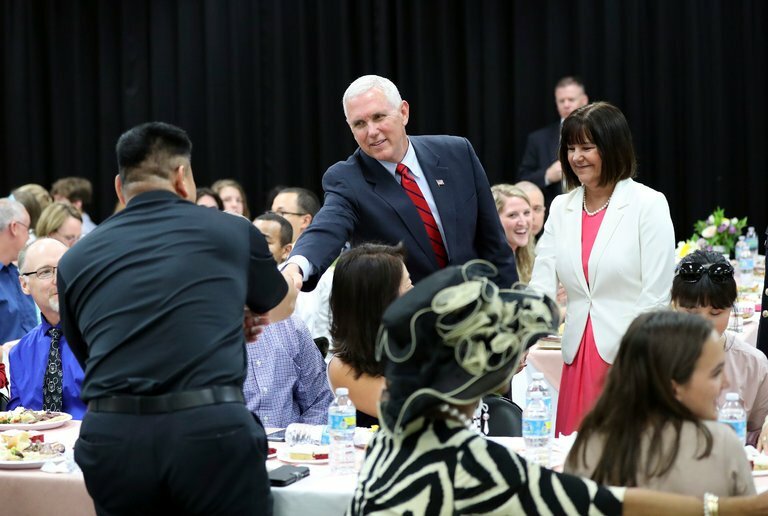 16 Apr, 2017 by	Margaret M.
On Easter Sunday, Mike Pence set up to have dinner with the men and women of both American and South Korean troops and their families. And yes, his wife Karen Pence was indeed with him as well as his two daughters. Pence and the second lady arrived in the afternoon at Seoul National Cemetery where the Vice President walked down a path lined with guards. He stopped at one point to acknowledge the troops, then continued on to a memorial tower. Accompanied by the superintendent of the cemetery, the head of the memorial division, Mrs. Pence and their two daughters, a guide walked them through steps of a ritual in English. After laying a wreath, the Pences attended an Easter Sunday service at a church located on the Yongsan military base in Seoul. Pence made some short remarks about his father, a Korean war veteran, before dinner was served. And of course, the President had a message he wanted to be sent to the crowd. After meeting with the leadership in Korea, Pence will be going on to Japan, Indonesia, Australia and finally Hawaii.